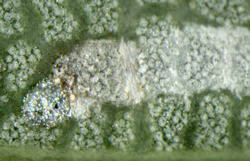 The mine begins as an inconspicuous lower surface epidermal corridor, beginning at an iridescent egg shell. This corridor is followed, and mostly replaced, by a relatively small, lower-surface, tentiform mine with many weak folds. 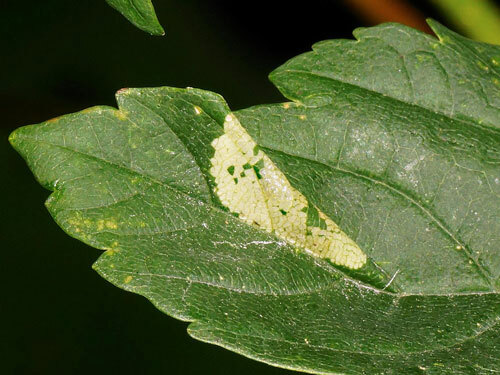 When the mine happens to lie close to the leaf margin the leaf may fold downwards over the mine. 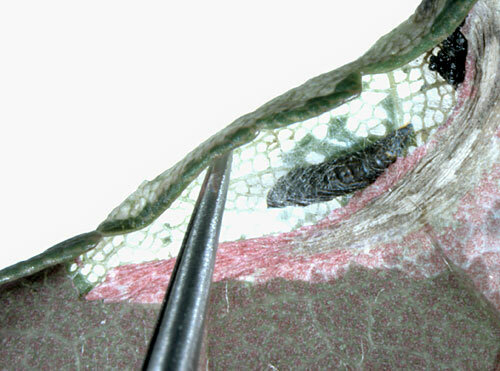 Pupa in the mine, dark brownish black, in a loosely spun cocoon. Frass heaped in a corner of the mine. Buhr (1935a) additionally mentions Acer saccharinum. 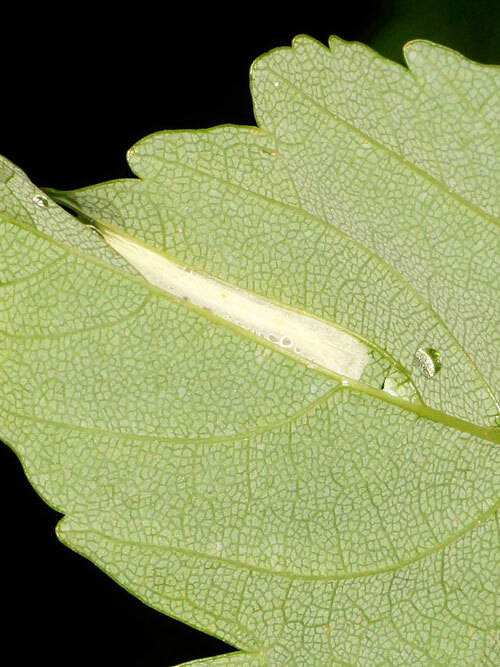 Larvae in May – July, and September – October. 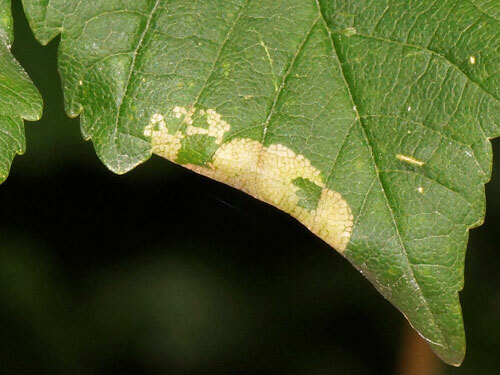 NE recorded (Kuchlein & de Vos, 1999a; Microlepidoptera.nl, 2009). From Sweden to the Pyrenees, Italy, and Bulgaria, and from Britain to South Russia (Fauna Europaea, 2009). 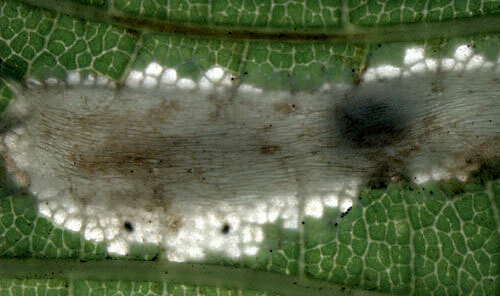 Lithocolletis geniculella; L. dahmiella (Sorhagen, 1900); Lithocolletis, Phyllonorycter acernella: auct. Ahr (1966a), Bengtsson & Johansson (2011a), Buhr (1935a, 1964a), Buszko (1992b), Csóka (2003a), Deschka & Wimmer (2000a), Deutschmann (2008a), Emmet, Watkinson & Wilson (1985a), van Frankenhuyzen & Houtman (1972a), van Frankenhuyzen, Houtman & Kabos (1982a), Gregor & Patočka (2001a), Gregor & Povolný (1950a), Haase (1942a), Hering (1931a, 1934b, 1957a, 1961a), Huemer (1986b), Huemer & Erlebach (2003a), Jaworski (2009a), Kasy (1983a, 1987a), Kollár (2007a), Kuchlein & Donner (1993a), Kuchlein & de Vos (1999a), Maček (1999a), Matošević, Pernek, Dubravac & Barić (2009a), Nel & Varenne (2014a), Nowakowski (1954a), Patočka & Turčáni (2005a), Plóciennik, Pawlikiewicz & Jaworski (2011a), Robbins (1991a), Sefrová (2005a), Skala (1941a), Sønderup (1949a), Starý (1930a), Szőcs (1977a, 1978a, 1981a), Tomov & Krusteva (2007a), Wieser (2005a).